How do I apply for the Apple Card? Can I get a physical card or is it virtual only? Are there any sign-up bonuses? What’s the Daily Cash rewards rate? What if I miss my payment due date? Will Apple see all of my transactions? Will Goldman Sachs sell my data? Apple says the Apple Card will be available this summer. With your iPhone, of course. Applications go through Apple Pay in the Wallet app, which means you’ll probably be periodically bothered to apply if you don’t already have one. Just remember that it’s a credit card, so the application will probably still ask for your work history, social security number, etc. So I have to have an iPhone? That’s right. The card information is stored in the Wallet app, and you need an iPhone to get it. Will my old iPhone work? Probably. Any iPhone that supports Apple Pay and the Wallet app will work, so unless you have an iPhone 5s, you’re good. You can’t download the Wallet app on the iPad, so there’s no way to apply, and it doesn’t have NFC so you can’t use it in stores. You will be able to use it for Apple Store app and online Apple Pay if you sign up on your iPhone, however. Apple is also offering a laser-etched titanium card for those times when Apple Pay isn’t available. In true Apple fashion, the card is minimal and gorgeous, with no numbers, expiration date, or CVV code to muck it up. What if I need my card number or expiration date? You’ll find that information in the Wallet app. What if I lose my Apple Card? Apple will provide a button in the Wallet app so you can freeze your card and order a new one. What bank is issuing the card? Apple has partnered with Goldman Sachs. Of note, this is the bank’s first consumer credit card. Apple says approval takes minutes, so the whole process probably takes about as long as it would when applying for a store card. When can I start using my Apple Card? Since all of your card information is stored on your phone, you’ll be able to start using your new card as soon as you’re approved. Just like you would with any other card. When you buy something at a store that accepts Apple Pay you’ll be able to hold your phone near the contactless reader or double-click the home or power button (depending on your iPhone model) to quickly bring up the pay screen, and authenticate using Touch ID or Face ID. Can I use the Apple Card with my Apple Watch? Of course. Since it’s a regular credit card, it’ll work the same way as any other card. Can I schedule payments for things like recurring bills and utilities? Since you’ll have a standard number, expiration date, and CVV in the Wallet app, you’ll just need to input that information in the payment page for whatever bill you want to add. Apple didn’t mention anything about sign-up bonuses during the Apple Card announcement, but that doesn’t mean there won’t be sporadic offers to entice new users. Yup! Apple’s rewards program is called Daily Cash. Rather than a complicated points system, it simply pays you cash back for every purchase you make. Apple Card rewards are tallied each day and delivered via a cash card. The Apple Card will pay you 3 percent back on Apple Store purchases and iTunes downloads, and 2 percent back on all other purchases made using Apple Pay. When you use the physical Apple Card, however, you’ll only get 1 percent back. Is there a limit to how much Daily Cash I can get? Nope, Apple doesn't set a ceiling on how much Daily Cash you can earn, but the amount you earn is based on how much you spend, and there is a limit on that. Can I spend my Daily Cash immediately? That’s why it’s called Daily Cash. Instead of waiting a month or a year to get a rewards check, anything you’ve earned will be automatically deposited into your Wallet in the form of an Apple Pay Cash card. 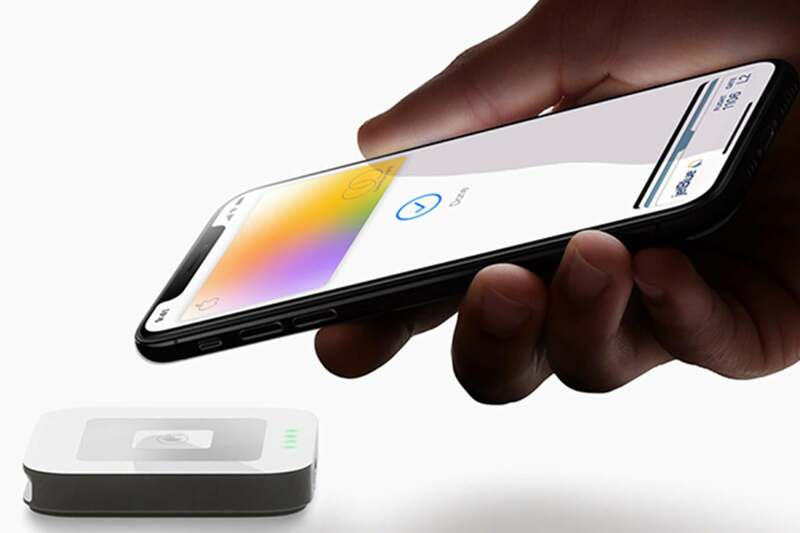 From there, you’ll be able to transfer it to your bank account, send money to a friend, or just use it to buy something at any store that accepts Apple Pay. What if I need to return something that I’ve already received a reward for? 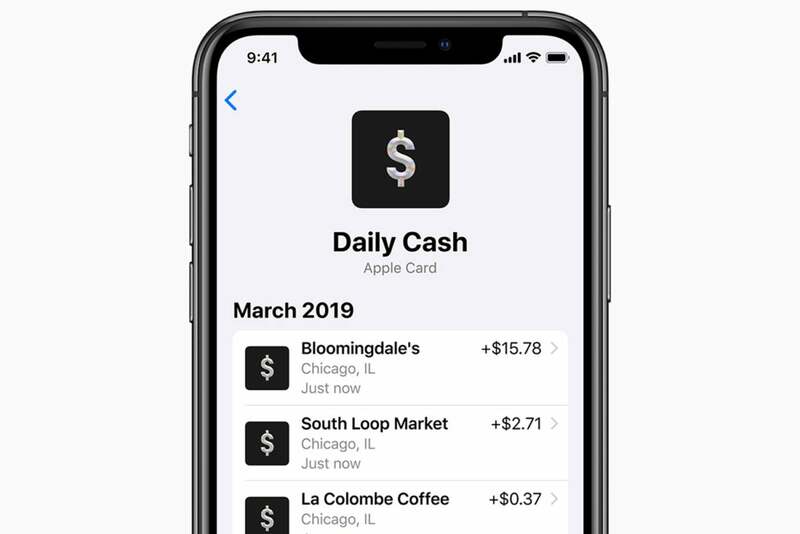 That’s not entirely clear yet, but presumably Apple will either charge your card the amount that needs to be reversed or deduct it from your Daily Cash balance. Where can I see a record my transactions? Again, nope. Apple says there are no fees at all for the Apple Card, even if you accidentally go over your spending limit. Apple’s smart spending analyzer will tell you how much interest you’ll owe based on your payment. Apple boasted that their interest rates are among the lowest in the industry, but they’re not exactly friendly. On the Apple Card site, Apple says the variable APRs range from 13.24 percent to 24.24 percent as of March 2019, so that could change by the time the card launches. We don’t know what Apple’s terms for cash advances will be, but generally they carry extremely high interest rates. 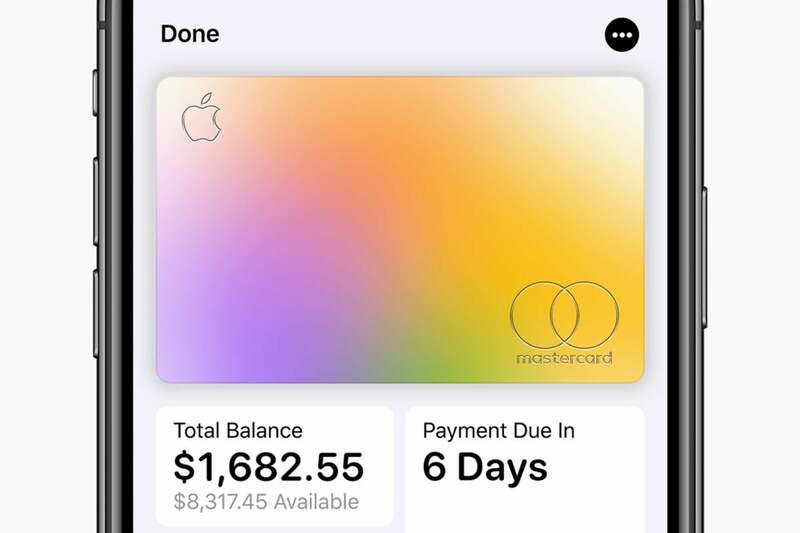 Instead of a flexible due date, Apple is making all card payments due on the last day of the month, regardless of when you applied. Since there aren't any late fees, it isn't clear how Apple will be applying interest changes to your bill. Credit cards are required to offer at least 21 days between when your bill arrives and it's due, but since there will presumably be no paper statements with the Apple Card, we'll have to wait to see the final terms and conditions. You’ll make payments inside the Wallet app using a Pay button. Can I make more than one payment a month? How can I see my interest rate and penalties? Before you submit your payment, Apple will show a smart payment suggestion wheel that lets you know how much interest will accrue based on how much you pay. Is the Barclaycard Visa with Apple Rewards going away? It’s unclear whether Apple will continue to offer or support the Barclaycard Visa for Apple Store purchases after the Apple Card launches. 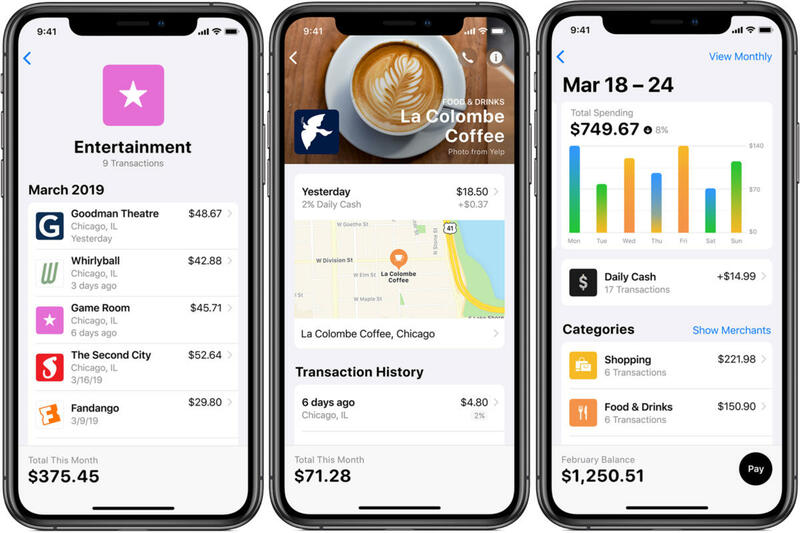 Apple says transaction history and spending summaries are all generated on your iPhone, so Apple won’t be able to see any of your card data. Since they’re the ones lending you money and securing each transaction, Goldman Sachs will have a record of every purchase and payment you make with your Apple Card. What if I need to contact support? Apple has baked Apple Card support right into Messages via Business Chat. Instead of calling an automated service, however, you’ll simply send a text and a person will respond 24 hours a day, seven days a week.